A limited amount of books are available in Greece. Contact me for details. 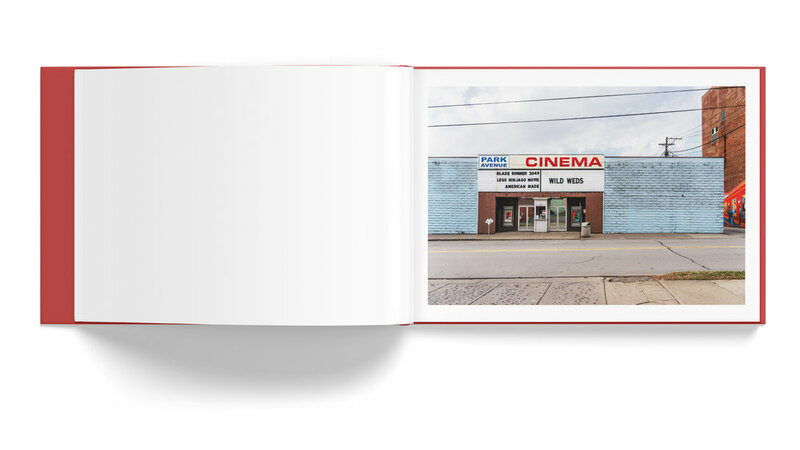 Niko J. Kallianiotis' first monograph, America in a Trance dives into the heart and soul of Pennsylvania's industrial regions, a place where small town values still exist and sustainable small businesses once thrived under the sheltered wings of American Industry. It was here, to the cradle of American industrialism, that immigrants from tattered European countries once crossed the Atlantic for a better future. Some, like Kallianiotis, still do. Born and raised in Greece but now a proud Northeastern Pennsylvanian, Kallianiotis has called this place home for roughly twenty years. Those decades have taught him how beliefs from both sides of the fence in the current political climate have a direct effect and interest in these towns. And yet, Kallianiotis achieves a certain level of neutrality within the work. Whether it is the hard Pennsylvania coal towns to the East, the shadows of looming steel stacks to the West or every faded American dream in between. Through the use of light and color, an illumination of hope, the photographer explores his own relationship with the land. Within America in a Trance there is the silhouette of what once was, streets and storefronts thriving, and the echo of that time still ringing in the bricks of the houses and churches. Luke Wynne began his photographic career in NYC. He moved to Los Angeles in 1980 where he was an editorial, portrait and movie photographer. His portraits of Hollywood movie actors were syndicated worldwide by the Gamma Liaison Agency. While living in Italy from 1999 to 2010, Wynne taught Master Classes in portraiture and exhibited extensively in the Veneto region of Italy. He returned to the United States in 2010 and received the National Endowment for the Arts in 2011. In 2015 he debuted his book, and show, Artists in Residence at the Crayola Gallery in Bethlehem, PA. In 2016 Mr. Wynne curated and participated in the Allentown Art Museum exhibition, Allentown X 7: Photographic Explorations. He is currently an Adjunct Professor of Digital Photography at Moravian College, Bethlehem, PA. He is also a founding member of the photographic collective Frame 37. Parker Reinecker is a Documentary/Street Photographer and writer based out of Atlanta Georgia. He is currently working in Northern Georgia, Northeastern Pennsylvania, and the American Southwest. Growing up in coal country, Scranton Pennsylvania, with a bar and a church on every corner, his work touches on the experience and struggle of growing up in the blue collar United States. Drawing inspiration from his own struggles with personal identity, crime and homelessness which can be receptive within the compositions of light and shadow, he documents the broken landscape of “Small Town America” and the conflict of poverty and beliefs, values and traditions, hope within the broken dreams and some touches of humor within it all. Award winning author and journalist Seamus McGraw spent his youth and now his dotage in the woods of Northeastern Pennsylvania. He's the author of several books, including "The End of Country, Dispatches From the Frack Zone," "Betting the Farm on a Drought, Stories from the Front Line of Climate Change," and most recently, "A Thirsty Land, The Making of an American Water Crisis". His next book, an examination of America's deadly gun crisis, is slated to be published by University of Texas Press in spring 2020.